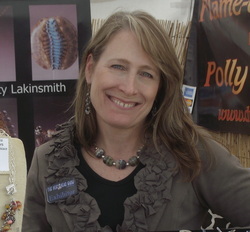 In 2003 I happened to take an introductory Friday night bead making class at Cabrillo College with Jackie Marr. With great stress I produced a number of horrible fried objects. It mystifies me that I had never seen a lampwork bead before I took my first class (and would not see any for several months as I practiced cautiously in my garage), but yet I felt drawn to it. I was terrified, and completely useless. But there was no turning back; my curious passion for bead making was awoken and it has not slept since. At first I read books and followed recipes until I had learned the techniques. And then I threw caution to the wind and tried new things, some of which worked, and some which didn't. After several years of practicing on my own on my Hothead torch, I got the courage to take my first "real" class, but I had never used a propane and oxygen torch before. The teachers' beads were much larger than mine, and many of my attempts cracked, if not in class, then the next day when they came out of the kiln. I took more classes with teachers who inspired me, and it became clear that I would be fascinated by this medium for many years to come. The sky was the limit and I was hopelessly hooked. I learned that in addition to making beads from molten glass, I was also fascinated with designing them into unique jewelry pieces. I've learned to sculpt my own unique clasps and other components from fine silver clay, using textures I find from nature. I've become very fond of incorporating several media at once in my pieces, such as fiber, seed beads, and trinkets. In my wooded, mountain studio I am driven to replicate organic patterns – normal and cancerous cellular structure, dangerous reptiles and plants, the incredible night sky, When I am at the torch, the molten glass picks me up and carries me on a journey to exotic destinations, and the ride is usually exhilarating. Learning the various ways I can coax the glass into doing what it wants to do naturally is thrilling to me, and she never fails to surprise me with her desires. Since my initial encounter with the flame, I am thrilled to have been able to take classes with some incredible teachers: Jen Geldard, Kate McKinnon (PMC), Andrea Guarino Slemmons, Trey Cornette, Michael Barley, Kyle Cassidy (Photography), Sara Sally LaGrand, Tink Martin, Jerry Harr (silversmithing), Rashan Jones, Amanda Muddimer, Kristina Logan, Alison Antelman, and Heather Trimlett. Now, instead of feeling fearful, I melt glass to relax. I love collaborating with artists in other media, and the back and forth in our creative play helps me to see my work (and myself) in new ways, and is energizing.